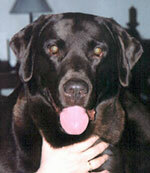 Buster was one of the friendliest, most loveable labs in the world. Everybody loved Buster. He was a reliable, sound producer, and sired th greatest pups, many with CKC titles of all descriptions, (show field & obedience.) 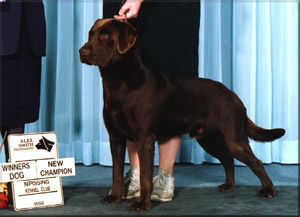 His champion daughter Coco (Ch, Staghorn's Hot Coco) produced his champion granddaughter, Cognac, (Multi BPISS Ch. Staghorn's Hot Toddy at Madabout) who produced Can Ch/CFC Ch Madabout Dubois Ray of Light, (the lovely Lucy, proudly owned and impeccably trained by Carla Dubois) as well as BPISS Ch. Madabout Say Cheese Please, who won Best Puppy in Show at the 2007 POTOMAC, which is the largest Labrador Specialty in the world. As you can see, he made an excellent contribution to the breed, especially in chocolates. Thank you, Buster. When I brought you home at 7 weeks, I had very high hopes for you and you never let me down. Born in 1994, Buster lived until 2009, just 4 months short of his 15th birthday. He was a wonderful companion to Eartha and Edward, his foster family. He was a lucky boy to have such a great family to love him and I loved him very much as well. We buried this beautiful boy in a sunny spot at Staghorn, on a warm August afternoon, with his blanket and favourite toy. Like Mac, he lived accross many changes in Labradors and proved himself in terms of his value as a stud, but more importantly, his longetivity of health, while maintaining the kind and loving devotion of a true Labrador Retriever. I'll always miss you, Buster.